Guitarist and Composer Stefano is a former child prodigy who comes from a Musical Family. As a performer Stefano is known for his Dynamic Stage Presence and Brilliant Technique. He has appeared across the US and Europe as Solo Recitalist, Concerto Soloist,Chamber Musician, and as Half of the Renown “Edwards-Simmons Guitar Duo”. Stefano holds a Bachelors Degree from De Paul University in Chicago, where he studied under guitar legend Leon Borkowski and persued Master of Music studies as a scholarship student under master teacher Mark Maxwell. Stefano has also studied with guitar masters Pepe Romero, Christopher Parkening, Denis Azabagic, Douglas Neidt, and Robert Guthrie. He was runner up in the American Society of Musicians Guitar Competion. 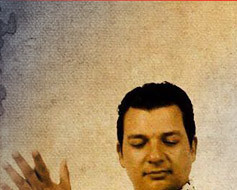 Stefano has been featured in performances with many notable artists, including flamenco guitar master Carlos Montoya, violin virtuoso Gidon Kremer, and legendary jazz pianist George Shearing. He has also been active in theatre productions, most notably The Goodman Theatre’s production of Federico Garcia-Lorca’s “Yerma” and Light Opera Work’s production of “Man of La Mancha”. His Recordings have been featured on WFMT fine arts radio in Chicago and on Radio France. Stefano is a prolific composer for both film and live theatre, as well as his beautiful compositions for Guitarra Azul’s debut CD “Mariposa” and Guitarra Azul's latest CD "Oasis". A Chicago native of Ecuadorian descent, Guitarra Azul’s David Chiriboga began playing guitar as a teenager. Originally trained on the guitar in both classical and folk styles, David’s passion for music was truly ignited when he discovered Flamenco. David’s deep brown eyes and soft-spoken demeanor give him an air of quiet mystery, but with his guitar in hand he creates music full of pathos and pining perfect for the soaring passion of Guitarra Azul. David’s love for flamenco brought him to Spain to study with master flamenco guitarists in Granada, Madrid, and Seville. In addition to Guitarra Azul, David has performed with the flamenco dance company Ensemble Espanol, Bandoleros, and El Payo. David has been seen on the ABC, FOX, and WGN television networks and has performed at eclectic venues across the country including U.S. Cellular Field, Café Bolero, Maya del Sol, Katerina’s and La Tasca in addition to performing for numerous concert appearances and corporate events with Guitarra Azul. David maintains an active private studio in Chicago and has collaborated with the world-renown Old Town School of Folk Music for flamenco dance classes in which he both taught and played guitar. A Guitarra Azul member since 2006, David received his Bachelors degree from Northeastern Illinois University. Be part of the excitement! Experience David’s sublime musicianship live with Guitarra Azul and come away thrilled and transformed by this master guitarist’s mesmerizing artistry. Javier began playing percussion at the tender age of eight, studying classical percussion and drum set with his uncle, Edgar Saume, and performing with the Gran Mariscal de Ayucucho Orchestra, Ensemble Gurrufio, and the Miranda States Orchestra in Venezuela prior to moving to Chicago in 2001. Javier received his Bachelors degree at the Chicago College of Performing Arts of Roosevelt University where his teachers included Ed Harrison, Paul Wertico, and Guitarra Azul’s own Ruben Alvarez. One of the most accomplished hand-percussion artists of his generation, Javier has toured the U.S. with Rhonda Richmond’s “The Unbroken Circle: From Africa to the Mississippi” and shared the stage with Reginald Veal, Herlin Riley, and Cassandra Wilson in addition to the grammy-nominated Sones de Mexico Ensemble. Antonio J. Mhoon is one of the most versatile and accomplished jazz bassists in the Chicago area. His performing credits include the Morris Ellis Jazz Orchestra, Pete Cozy Jazz Group (formerly with Miles Davis), and the Northern Illinois Jazz Band, as well as collaborations with Jazz greats James Moody, Frank Mantooth, Von Freeman, and Clark Terry. Antonio has also shared the stage with gospel artists Tramaine Hawkins, The Staple Singers, The Winans, Jessy Dixon, The P.T.L. Singers, Calvin Bridges, The Wooten Choir Group, The Prophets, The Thompson Community Singers, and The Bartlett Sisters. Antonio attended Columbia College majoring in music composition and electric bass studies with an emphasis in R&B, classical and jazz. A highly regarded and experienced music educator, Antonio taught promotion at Central State University and bass and jazz studies at Columbia College, in addition to general music at Our Lady of Grace and Joseph Warren Elementary. Equally in demand for studio and show work, Antonio can be heard on jingles for Kraft, Leon’s Barbeque, Nelson Brothers, Picks & Pans, Let’s Talk Flicks, and Ready Wipe, as well as the campaign music for former Mayor Harold Washington. Antonio has recorded with the Thompson Community Singers, Calvin Bridges, The Prophets, The Barrett Sisters, Northern Illinois University Jazz Band (Live at Montraux), James Cleveland, Arthur Scales, Ethel Holloway, The Staple Singers, Rod McGaha, and Mike Hayward. He has also performed for many plays, including Your Arms Too short to Box with God, Dina, The Jackie Wilson Story, and The Other Cinderella. 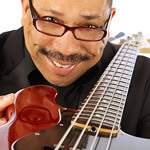 In addition to being the bassist for Guitarra Azul, The Steve Edwards Orchestra, and Chicago’s celebrated Black Ensemble Theatre, Antonio is the owner of MhoonUnit Midi Recording Studio. Many people recognize Osvaldo "Ozzie" Aviles for his recent work with the renown World Music Group Guitarra Azul. But his Passion for Percussion began long before then. Some say it began with his Puerto Rican Mother who was an award winning dancer, Others believe his passion links directly to his Father, a percussionist in New York. Still others give credence to his Step Father, a steel drum and Timbale Virtuoso. After his elementary school forays, the sound of his nimble hands striking the skins of Drums began to echo at Northwestern University, The University of Illinois, Michigan State University, Malcom X College and many more venues. One of his most memorable shows occurred on our Capital's steps in Washington D.C.
Ozzie accomplished all of this before he even finished high school. After finishing high school in Chicago, Ozzie's drive for music intensified as he continued to perform live and record. With the dedication and support of friends and family, Ozzie established himself as one of the strongest percussionists in Chicago. As bands would come into the city, they would often ask for his rhythms to join their sweet sounds. Sonora Poncena, DLG, Mickey Taveras, Victor Manuelle, Marc Anthony, Tito Rojas, Frankie Negron, La Patrulla 15, and countless other bands specifically sought out Ozzie's accomaniment as they wowed audiences all over Chicagoland. Could it be that the Salsa band Son del Barrio, that earned a day named after them by Mayor Daley, helped earn Ozzie the Credibility he deserved to accompany these renown acts? Most Likely, it was simply Ozzie himself, with his radiant smile and magnificent rites that kept these bands calling time and again, regardless, his work with the band Fuerza y Alma brought him to Sony Records in Miami. That put their single in a position to win the "Best Song of the Year" award and "#1 Band of Chicago"! And he does it with unmatched energy and irresistible smiles, all the while giving credit to God, his Family, and his fellow musicians. Howie Kantoff has been playing drums and writing music since he was a teenager growing up in the Chicago area. After receiving a psychology degree from University of Michigan, he immediately embarked on his career as a professional musician. Throughout the 1990s, Howie was the drummer for Reprise recording artists Poster Children, with whom he appeared on MTV and at Lollapalooza. From 2000-2012, Howie drummed for the performance art ensemble Blue Man Group. In addition, Howie has taught drum set at the Old Town School of Folk Music, and has played for a wide variety of artists and theatrical productions. Besides drumming, Howie also composes music for modern dance and film; some of his compositions can be heard at www.howiekantoff.com. Howie is honored to be playing alongside the great musicians in Guitarra Azul. 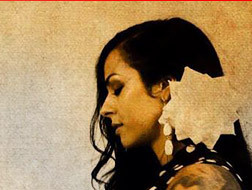 Flamenco dancer and percussionist, born and raised in San Juan, Puerto Rico. He began his artistic formation on April 2006, with Antonio Santaella, dancer and choreographer from Granada, Spain. Since December 2006, Monge worked in various "tablaos" of the capital city; including "Barrachina", "El Chotis", "Divino Bocadito", "Casa Botín", "Bar Gitano" and "El Mesón La Guitarra". 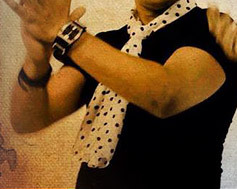 "La Pasión del Flamenco…Tradición, Encuentro y Cultura Nuestra"
In January 2010, he co-produced the show "Entre la Ida y la Vuelta" on Nuyorican Café, Old San Juan, with dancers Vivian Bruckman and "La Coralillo". These were Sold Out shows and it marked the beginning of the flamenco company "La Compañía". Along with the company, Monge performed in various venues (e.g. Ponce Art Museum) and together they co-produced another show on Febraury 2011 called "De Tablao... La Pasión del Flamenco", at the Bóveda Triana on the Old San Juan. His dance education include San Juan, PR; San Diego, CA; Sevilla, ES; Chicago, IL; and the Flamenco Festival of Albuquerque, NM: with such artists like Jossette Reily, Cihitli Ocampo "La Gillardi", Juan de los Reyes, "El Torombo", "Farruquito", Carmen Ledesmas, Carmela Greco, Vida Peral, Miguel Vargas, Jose Barrios, Rafael Campallo, Alfonso Losa, Olga Pericet, Jeanne D’arc Casas and Chiara Mangiameli. Ronaldo is currently living in Chicago, IL and performs in monthly venues like Café BaBaReeba, Bulerías Tapas and Bordel. To make sure you have Ronaldo Monge's latest performance schedule, follow him on Facebooktoday.